The ALL-NEW Paragon3 with Rolling ThunderTM sound and control system for HO scale has all the features of its predecessor Paragon2, but now includes more, higher fidelity sounds than ever before, plus the ability to reproduce low frequency sounds that give your railroad the feel and depth of sound of a real locomotive! How does it work? The speakers in most HO scale locomotives will only reproduce sounds above approximately 600 hertz. The human ear can detect sounds between 20 to 20,000 hertz, and we can feel sounds at even lower frequencies. 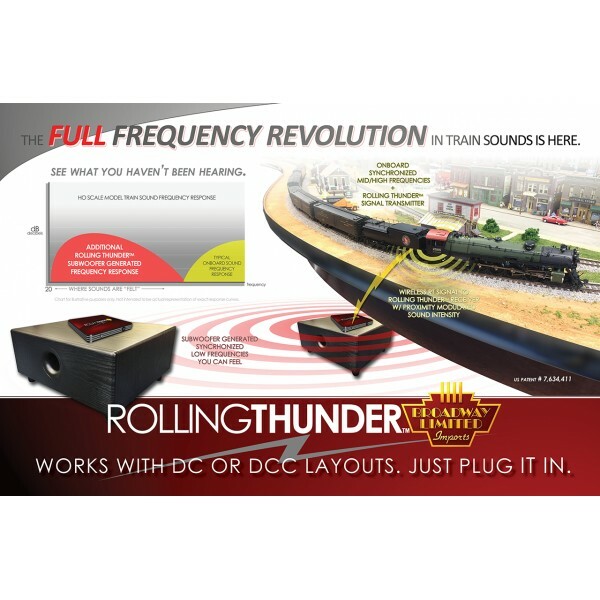 Many of the sounds real trains make are in the lower frequencies that models cannot reproduce. This is due to the tiny speakers which cannot move enough air. To overcome this shortcoming, Paragon3 incorporates a cutting edge radio transmitter system we call Rolling ThunderTM that sends the low frequency sounds to a specially designed receiver and subwoofer under your layout. Since low frequency sounds have a longer wavelength, it is difficult for the human ear to detect the direction of the source. The result is that while the locomotive moves around the layout, you can hear the high frequency sounds coming from the locomotive, and the low frequency sounds from the subwoofer-- all perfectly synchronized to the motion of the locomotive and the puffing of the smoke, and your ears will perceive the full array of sound as coming from the model! • Rolling ThunderTM works with DC or DCC layouts. Just plug it in.